Coaching is an essential component of an effective professional development program. Are you hoping to unlock and increase innovation through the use of technology? Are your teachers using devices, but their projects and assignments have not changed much? Job-Embedded PD is rated as the most powerful training for teachers because of isolation within the classroom and lack of time. It is usually through Instructional Coaching that this is accomplished. Many schools are calling on teachers within their buildings to coach part time and teach part time. This is an excellent model for regular classroom instruction, and it works just as well for technology training as long as the coaches are getting regular technology training, too, to keep them fresh and up to date on the latest EdTech advances. For some schools and districts, this is difficult. This is where Cultivating the Learning can collaborate with you to solve your coaching problems. Successful coaching can be transformative as can be seen in the data and testimonials below. The idea behind Collaborative Coaching is that the coach is not evaluative (see Interview With Superintendent Pam Moran On Instructional Coaching). This coaching is job-embedded because it rarely occurs before or after school. We meet with my teachers either live or via a Google Hangout. Usually, we try to block out two periods for each teacher, one of which is usually a prep period that enables us to talk, plan, or reflect. In the beginning, We observe the teacher to get to know his/her style. Then we meet to discuss goals for technology use and upcoming projects and/or standards that need to be covered. From there we plan. Our next visit might be another planning session building up to the technology-infused lesson. Depending on the teacher’s schedule, we might debrief to reflect during lunch, during a prep period, or after school to ensure that debriefing occurs in a timely manner. All of this is taking place during the contractual day making it more convenient and more powerful for the teacher. "I enjoyed this class. The pacing was excellent as well as Eileen's instructions. Now I will be able to do a newsletter with my 4th grade students." Before Our Calendar Fills - Book Us Now! Are your teachers tired of low quality training that doesn't apply to them? Our trainings are personalized and have something for everyone. We poll your teachers before creating your training. Differing levels will have different activities to meet your teachers where they are and challenge them to grow. Call us now for a free training consultation. The graphic above shows data from teachers in a program dedicated to technology integration growth. They expressed that the one thing that made them grow most as teachers using technology is the job-embedded PD they receive through their Technology Collaborative Coach. Because of this realization, schools and districts should consider investing in technology coaches within their buildings as a part of their technology budget. While there are probably people in place to help struggling teachers, when it comes to technology, schools and districts get a bigger bang for their buck when they choose high flying teachers and help them fly even higher with a Technology Collaborative Coach because she/he provides job-embedded training. How will a Technology Collaborative Coach help your teachers? Eileen has been one of the greatest gifts of my 18 teaching years. If every teacher in [my] county had an Eileen in their corner, our students would be learning even more authentically and meaningfully than they do today. 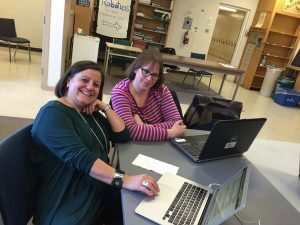 I am grateful to Eileen for pushing me out of my comfort zone with every unit/project/lesson we plan together, and I am equally grateful for her positivity and for the support she has provided me. My students are even more enthusiastic learners because of Eileen, the iPads, and the support and encouragement from [the District]! Eileen, you have been such an inspiration to me and have pushed me out of my comfort zone with tremendous support, and for that I will always be eternally grateful. After 30 years you still get me excited about learning new technology. You’re a great example for others!!! Eileen was amazing. Her willingness to come out to see how we were doing and offer her expertise was appreciated. She had a wealth of knowledge and gave so many great ideas. She was very accessible when I had questions or wanted to bounce ideas off of her. If it hadn’t been for [Eileen], I may very well have dropped out until I had time to teach myself about Google Classroom etc. Her help and support were invaluable!!! The ultimate goal of a Technology Collaborative Coach is to help teachers use technology to help students achieve. This could happen by increasing student interest or confidence, increasing digital differentiation through formative assessment, changing a teacher’s teaching style to include flipped learning or PBL or sometimes by revitalizing the teacher. Technology Collaborative Coaches are equals in the room with their teachers. Their role is to nurture and challenge. They are present to question the teacher in ways that get the teacher to grow and begin to answer her own questions. They also provide resources to assist the teacher along the technology integration journey. Teachers who have support and collaboration are much more creative and content in the classroom. Technology Collaborative Coaches plan with the teacher in advance to set the stage for a positive experience with technology. Things like expectations and timing or pacing can ruin a lesson. Sometimes coaches have to help teachers see that their expectations are too high or too low depending on the grade and the level of experience of both teacher and students. Sometimes a teacher over-plans for a single period only to find out that there is no reasonable way for her students to achieve what she had planned. Once the plans are in place, it is so very helpful to have a coach in the room when the lesson is being implemented. This is especially important during the initial technology deployment, the first few technology lessons, or the launch of a totally new app. Those of us who have experimented with technology know that it requires a lot of learning, troubleshooting, and thinking fast on your feet. For some, this is a game changer, and it is just not worth it. For others, it is a challenge worth overcoming. The former is not a bad teacher for having given up. She might decide she just doesn’t have the time or the know how to proceed. This is where a Collaborative Coach is priceless. Troubleshooting on the spot, coaching students, encouraging all are vital if participants are to remain positive about the use of the technology. After the lesson has been completed, reflection is of utmost importance. First, it is important that the teacher reflect on how things went. Most of the time, the teacher points out 90% of what the Collaborative Coach is planning on saying. Then, the final 10% can be reviewed or ignored depending on how serious it is to the success of the teacher. Allowing the teacher to process the information first is key to growth of the teacher. Next steps wraps up a coaching cycle. This phase taps the teacher to decide how she wants to proceed. It gets the teacher looking forward to the next lesson. It might be a chance to try it again because she liked it and wants to hone it, or maybe she knows it should have been better and wants to try again for her own and her students’ comfort levels. Maybe she wants to try something more challenging, and something is starting to develop in her head. This brings the cycle back to the beginning with the planning phase starting right there. The coach simply needs to schedule their next session to plan or perhaps to observe and give feedback. 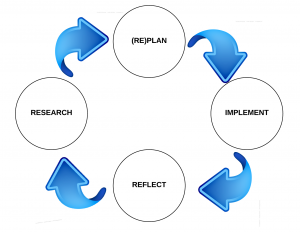 Coaching is a recursive process that rarely moves forward at all times. Oftentimes there is back and forth movement, and that is okay.